Being a qualified coach (and spending half of my time either in Lycra or IRONMAN-branded gear) it invariably comes up in conversations with “normal” people about the absurdity to the type of training and races I do. One of the more consistent responses in these conversations is somebody explaining to me how much they would love to (but could never!) do an IRONMAN race. I used to just nod in agreement, but as I built my coaching expertise, I found myself challenging people’s standard assumptions people made about why they personally couldn’t achieve what I’ve helped others achieve for years. Have you ever watched an IRONMAN in person? And by in person, I specifically mean not watching on TV where the cameras zone in on the chiselled pros battling it out at the pointy end of the race. Because if you have you will have witnessed athletes of all ages, shapes and sizes racing on the exact same course as the professionals. IRONMAN is a very personal journey, and people will have different race strategies and goals on the day. 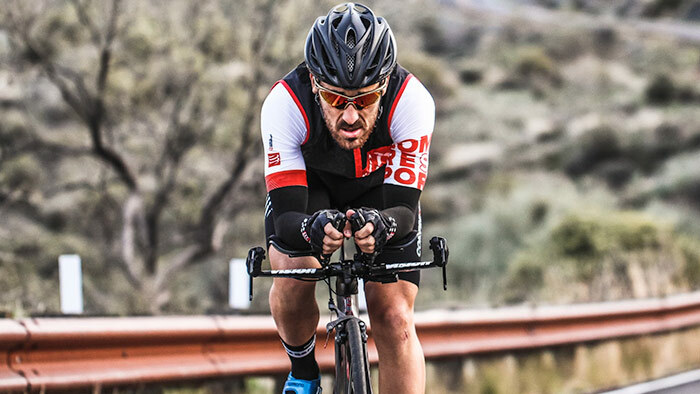 These can range from just finishing to qualifying for the world championship—my point is there are no physical barriers to doing an IRONMAN, if you are willing to really chase that goal. I always push the fact that people should see a race in person; at a minimum you will be uplifted by the strength of human spirit and more than likely be inspired to take on a challenge of your own. Typically when people say this to me, I conversationally ask them what TV programs they watch or how much time they spend on social media. When we go through the list—it can add up to around 10 hours a week! That huge chunk of wasted time is where I tell them I “find” the time for myself and my athletes. It was actually there all along. So essentially it is a question of priorities—we can find time if we want to—it is up to you if you choose it to be on the couch watching Game of Thrones or out on in the fresh air preparing yourself for an epic challenge. When I hear this, I ask what the person does for a living. The breadth of answers always fascinates me. Firemen, teachers, bankers etc. Digging a little deeper, I ask if they have ever faced a scenario at work where they needed to reach out to experts, and without fail, the response is always yes. I ask them why is this different to approaching an IRONMAN challenge. I tell them that they should look for someone who has completed an IRONMAN and ask them how they went about it and start their research there. Better still, if they seem really serious, they should seek out a plan or a qualified coach to help guide them on their journey. WARNING: Asking a recent first time finisher can turn into quite the monologue as they eagerly share every detail of their journey including weight loss stats, epic cycles and inevitably the feeling of accomplishment as they turned onto the finishing chute. When was the last time you were in a pool? When I ask people that, their minds typically drift back to the last holiday where they splashed around in the sunshine. So having established that they can actually swim, I ask whether they have ever had their stroke analysed or taken swim lessons. For novice swimmers, simply fixing a few key elements from stroke analysis and/or lessons can make huge leaps forward in their swimming ability. As a coach swimming is one of my favourite disciplines to teach/monitor as there are always lots of low hanging fruit that will help the athletes’ confidence and ability soar to the point that they are chomping at the bit to tackle that 3.8km swim! People fixate too much on the marathon element of the IRONMAN, I believe this is mainly as it a more tangible event that they can get their head around! However, in the IRONMAN world, as I tell my first timers, it is just a long run at the end of a long day. It is not necessary to have completed a marathon before an IRONMAN. It can help —but not as much as people think. Even in my training plans, I typically do not let my athletes exceed 26km in the longest runs they will do. The body can only take so much mileage. It is all about training smart and building slowly. If you train and prepare properly, you will be amazed at what your body can do on the day boosted by adrenaline and thousands of cheering spectators! In conclusion, unless someone explicitly says they have either no interest in taking on such a challenge that is a half or full IRONMAN, I can easily dismantle the barriers they are putting in front of themselves. So if you have ever watched an IRONMAN race or jealously viewed a clubmates finisher medal, I would urge you to challenge your own limitations.